Christmas is that magical time of year that brings everyone together... whether you like it or not. Luckily for you, booze exists, and they serve it at many of the capital's finest bars and pubs. Here are 20 watering holes that will welcome you in like family, only without the awkward questions, fights, and disappointing presents. Tucked away in the back of this jaw-dropping hotel, the mood here is festive on a normal day. Add in a little extra liquid cheer and you’ll be good to face the family. 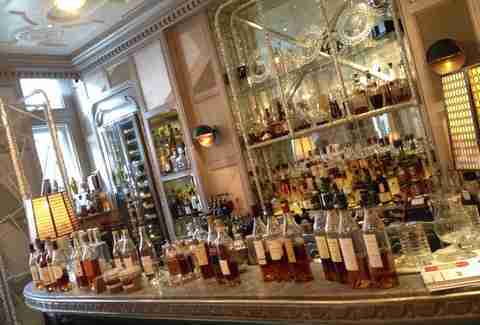 The LE is a bit of a playground for the young and beautiful, so get involved at the lobby bar, grab a seat in Berners Tavern, or sneak into the semi-secret Punch Room. 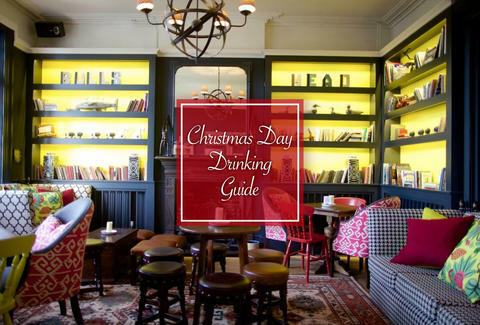 After the Artesian was voted “Best Bar in the World” the last four years running, it’s safe to say a Christmas tipple here is an excellent idea. Call it a present to yourself. Styled like a NYC open warehouse, H&B lets pretend you actually managed to escape the family this year and hide away in its massive overstuffed sofas. Bright and buzzy, this high-ceiling number is dramatically laid out with more flowers than you might think is possible -- but really the drinks are what you’re after, and they’re great. 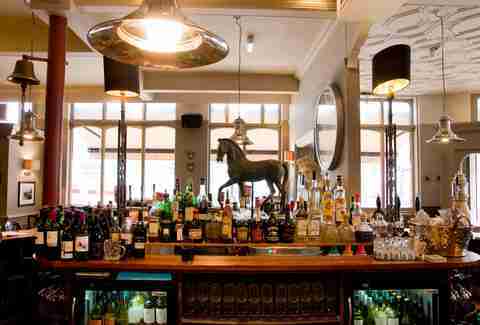 This old-school boozer is will knock off 10% of your bill over £150. 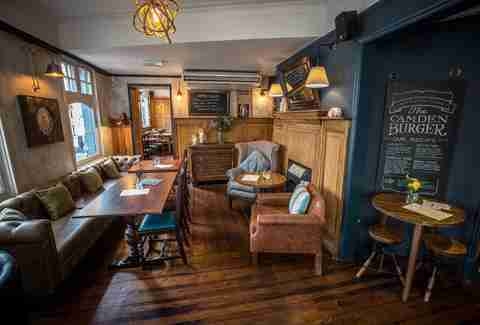 Known for its live jazz gigs, The Bull's Head allows you to escape the family with a solid selection of beer and a lovely view of the river. Wine and dine yourself at this US import. With posh nosh, cocktails, and plenty of glitz to go around, this is a day that will certainly sparkle. Cozy up to the resident pugs and lament those terrible presents your aunt gave you. It’s hard to say what's best here: the astounding views of the river, the strange and great drinks, or the superheros it has for staff. Pretty much the perfect package. Just down the river from London Bridge, The Anchor is the perfect spot to down a pint of Taylor Walker and and walk along by the Globe when it’s blissfully devoid of tourists. Having held on to its old man’s pub roots while moving on over the land of gastro, the Abbeville has held on to a cozy charm with pretty jaw-dropping food. Visiting Camden on Xmas day might be the best time to do so. The normal crushing throngs of tourists are decidedly thinner and more confused and they certainly haven’t found this pub with great food and a solid selection of beer. Just around the corner from the station, this drinkery is dog-friendly, has free Wi-Fi, and boasts a huge selection of beer to choose from. 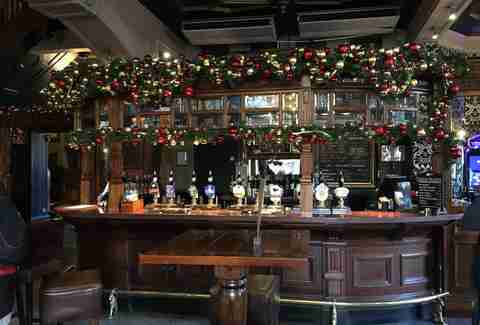 While its garden might not be the best attraction in December, this massive rambling pub still has plenty of cozy corners. Grab a pint and settle in for an all-day-er. Watching the world spin below you on any day of the year is just fine, but when you’re up on the 40th floor at Christmas... that’s just magical. If all you wanted for Christmas was lots and lots of beer, then The Dove is your perfect hideaway. It's got over 100 options, so you’ll be in heaven. 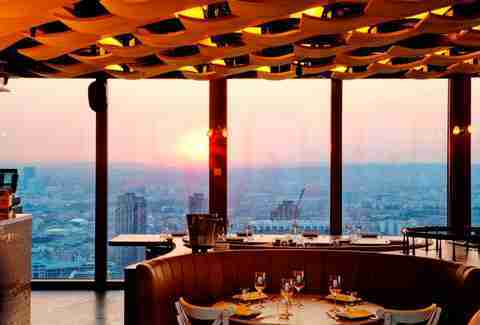 While the rather swank Ace Hotel is frequently overrun with Hoxtonites tapping away on their MacBooks, now is the time to go and savor that perfect cocktail. Hiding in Shoreditch House’s shadow, this pub is known for its roasts, tap selection, and excellent people-watching opps. Haley Forest is a London writer who’ll have what Santa’s having. Follow her at @HCForest.